I recently had the pleasure of doing a radio interview with my good friend and accomplished instructor Chris Foley. The topic got me thinking, most golfers never get to see a world class player up close let alone be involved in their development. So here you go, a little insight into what its like to work with the best of the best and how as a coach we are always working to find that one little improvement that will make the difference. If you were to ask most golfers what separates Jordan Speith from a good college player you will hear something along the lines of, he is a much better putter. Ask them again what is the biggest difference between Bubba Watson and that same solid college player and they will tell you distance. Bubba hits it so much farther than the college player and that is why he is better. The truth of the matter is they are probably correct. Jordan is a world-class putter and Bubba does hit it farther than most humans on the planet; but how much better and how much farther? The difference may surprise you. So what do the best coaches actually know about better performance and how do they help their players at the elite level improve? There is no sport where this is truer than in the game of golf. The game is literally a collection of shots where just a fraction of one area can determine the winner from the guy missing the cut. Simply put, a 3% improvement in putting from 9-15 feet can be the difference between making a seven-figure income and losing your card for a touring professional. A difference that many good players, coaches and certainly the average golfer may never notice. So lets take a deeper look at two coaching examples that will help paint a clear picture of where good actually ends and great begins. Here are two examples of students that I currently coach both playing the game at a high level. Player 1 is a professional golfer looking to make the next step and compete at the highest level. This particular player had a scoring average of 74.1 last season, solid but not good enough to compete against the best. As the coach it is my job to dig deeper and find out where we can get those 1, 5 or 10% improvements that will bring the scores down. Although there were a couple key areas where improvement needed to be made, I put our focus on the area we could get the biggest win right way, increased distance. We put together a specific plan that included a few swing changes and a workout routine both geared toward increasing distance. Over time the combination has produced an increase in distance of 11 yards on all drives and 19 yards on the longest drive. 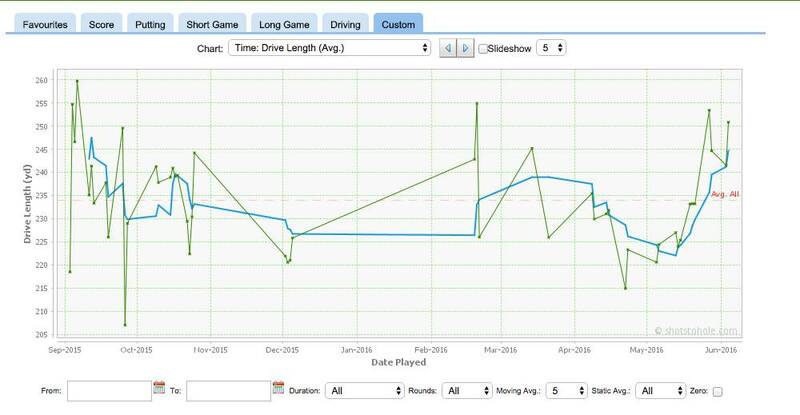 A small improvement of 5% but a total game changer in how this student now plays the game. Instead of hitting hybrids into par 4’s, she is now hitting mid irons. Par 5’s that were forever three shot holes are now routinely reachable in two and becoming clear-cut birdie opportunities. Player 2 is already playing at the highest level and is looking to move into the top category of competing to win every week. Once again as a coach I am not looking for major changes at this level, yet striving to find a 1, 3, or 5% improvement that will equate to 1 stroke over the course of four rounds. Once again I worked with the player and put together a specific plan that includes minor set up adjustments and swing mechanics along with a few practice drills all geared towards finding that little improvement. After few months and many long hours of dedicated practice and consistent monitoring the improvement comes in small percentages but large rewards. We see an improved GIR of 12.0 to 12.5 and a GIR inside 15 feet of 5.7 to 6.2. 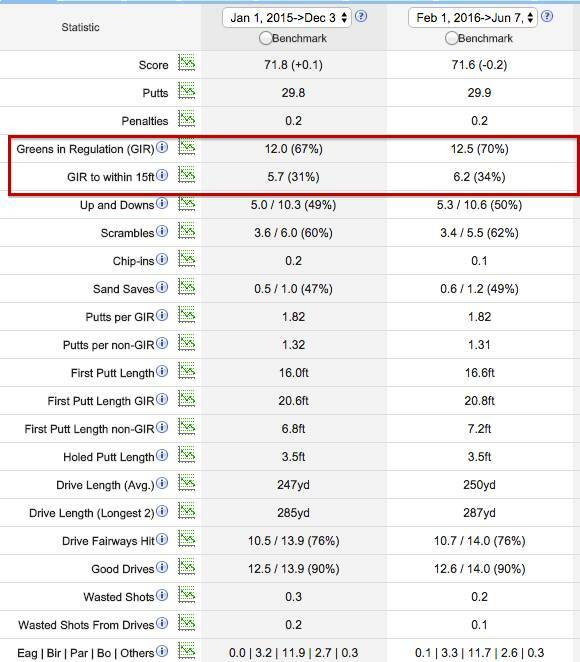 This minor 4% improvement results in 2 more birdie putts per tournament (.5 per round times 4 rounds = 2) and with a make percentage anywhere between 99% and 20% based on the range that’s at least one shot per tournament. Yes, one shot that very well may be the one stroke that moves her into the category of world class. The best really are not that much better than everyone else, however they are a little better in many areas and those many areas add up to significant differences on the scorecard. If you want to be the best and compete against the best you have to find out where the 1, 3 5% improvement will take your game to the next level. Based on years of experience my guess is the improvement will come in doing the ordinary things just a little better. A special thanks to Stuart Leong and the crew at www.shotstohole.com for providing great data that allows us to find areas of improvement that will directly change the scorecard.